Spectacular view of Boston and Cape Cod. Bird's Eye View of Boston Harbor in colors Along the South Shore to Plymouth Cape Code Canal and Provincetown Showing all Steamboat Routes. 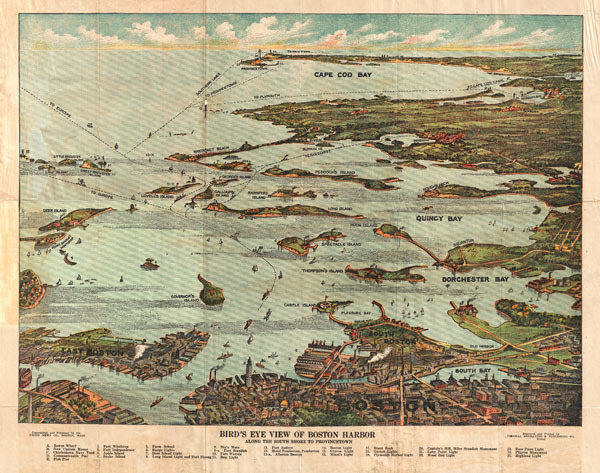 A remarkable chromolithograph map and view of Boston Harbor from Boston to Provincetown. Includes all of Cape Cod Bay, Quincy Bay and Dorchester Bay with the communities of Boston, East Boston, South Boston, Dorchester, Quincy, Hough's Neck, Mingham, Nantasket, Duxbury, Plymouth, Cohasset, Scituate, and Provincetown noted. Also notes many of the Islands in Boston Harbor including Moon Island, Spectacle Island, Thomson's Island, Long Island, Governor's Island, and many others. Ferry and steamboat routes are noted. Though undated the style is clearly that of the 1890s. Published by the Union News Company of New York and Boston. Very good condition. Folds into original binder but flattens nicely. Blank on verso.